Are court filing fees included in the fee? I finished the online interview. How long will it take to receive my documents? Do any documents require notarization? I want to use DivorceWriter to prepare my own divorce documents. What do I do next? How will the mailed package be labeled? DivorceWriter is committed to having the lowest price on the market. If you see a lower price we'll refund the difference. DivorceWriter accepts both credit and debit cards. You receive all of the completed forms and instructions needed to file your uncontested divorce. We charge the same price regardless of whether or not minor children are involved in your case. There are no hidden upsells. * Court filing fees not included. 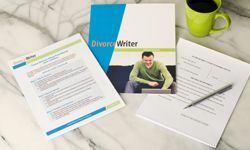 DivorceWriter currently supports the following states: Alabama, Alaska, Arizona, Arkansas, California, Colorado, Connecticut, Delaware, District of Columbia, Florida, Georgia, Hawaii, Idaho, Illinois, Indiana, Iowa, Kansas, Kentucky, Louisiana, Maine, Maryland, Massachusetts, Michigan, Minnesota, Mississippi, Montana, Nebraska, Nevada, New Hampshire, New Jersey, New Mexico, New York, North Carolina, North Dakota, Ohio, Oklahoma, Oregon, Pennsylvania, Rhode Island, South Carolina, South Dakota, Tennessee, Texas, Utah, Vermont, Virginia, Washington, West Virginia, Wisconsin, and Wyoming. Where available DivorceWriter may provide official forms published by your state. Like tax forms, blank state divorce forms can typically be downloaded from a state website at no charge. With DivorceWriter you receive access to online tools, information, and services to help you fill out and file all your own divorce forms quickly and easily. The DivorceWriter fee is not a fee for freely available blank forms. Links to free forms may be available in our Help Center. 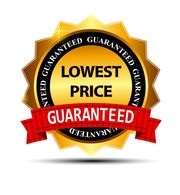 We are so confident in the quality of our product, that we offer a 100% money-back guarantee in the case your documents are not accepted by the court.